Now, I forget where I read that the dog on this lovely deep purple shirt is a Whippet, but that’s what I’m sticking with. 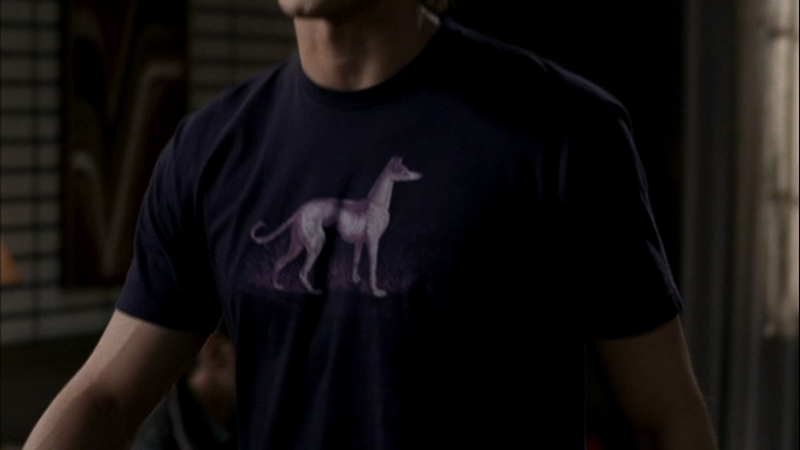 I’m not sure why Sam would buy a purple shirt with a Whippet on it, but he has. He apparently likes to sleep in it. As seen in both Asylum (1x10) and Scarecrow(1x11), Sam is sleeping in the Whippet Shirt when John calls. In Something Wicked (1x18), Sam wears it for the entire episode – but it's hidden under his other layers except for when he is in the motel room. I'd say, "may you return in season 6" but that would only happen if they find a MUCH larger version! Haha, nah, I think you're onto something there. There's been a conscious decision in wardrobe, I think, over the years, to gradually dress Sam less and less like a college student and more and more like a Hunter. It's why these days he's almost exclusively in plaids. That to me looks more like a Jared shirt that made its way into Sam's wardrobe. Since Jared loves dogs and seems to have passed that love onto Sam. :) I love it, it's cute, want to see it on him again! I'm pretty sure he wears this t shirt in houses of the holy (2x13) when him and Dean go the church and when he summons father Gregory then for the rest of the episode. Oh interesting! I'll have to take another look at that episode. There is a whippett in a video of Led Zeppelin performing "When the Levee Breaks". Maybe an homage to Zeppelin as well, keeping with the rock and roll theme.